Each fall, Gratia honors standout individuals and organizations who made significant contributions of time, talent and treasure over the past year to the College. Gratia also serves as a time for the Donnelly family to come together and thank each other for their efforts. This year’s event was the first to formally name a Staff Member and Faculty Member of the Year. The decisions were made based upon faculty and staff nominations to the Kansas Independent College Association (KICA). After an extensive search and an institution-wide vote, Donnelly College now has a formal mascot. The Donnelly College Dragons won out, and the mascot was approved by the College’s Board of Trustees. The Dragon ties in with Donnelly’s co-founder, Bishop George Donnelly, whose patron saint, St. George, usually is portrayed with a dragon. With its historical connection and strong presence, the Dragon is a great fit for Donnelly. Check back in the coming months to see how the Donnelly Dragon will look as the College’s mascot. In partnership with Catholic Charities of Northeast Kansas and the Archdiocese of Kansas City in Kansas, Donnelly co-presented a special pre-release screening of “The Letters,” a drama about the life of Mother Teresa as seen through letters written to and from her longtime friend and spiritual advisor over a 40-year period. Riead spoke to his inspiration for writing and directing the film, noting that he felt called to bring this story to life after the September 11, 2001 terrorist attacks. “The Letters” opened in theaters nationally on December 4. For more information on the film, see www.thelettersmovie.com. A crowd of more than 100 students, staff, faculty and community members joined Donnelly President Monsignor Stuart Swetland and Kansas Interfaith Power & Light Coordinator Rabbi Moti Rieber for a discussion on the changing climate and how students and community members can make a difference. This Donnelly Talks event was sponsored in part by the Benedictine Sisters of Mount St. Scholastica and a grant from the Mount Wangari Committee, honoring Wangari Maathai, a 1964 graduate of Mount St. Scholastica College. 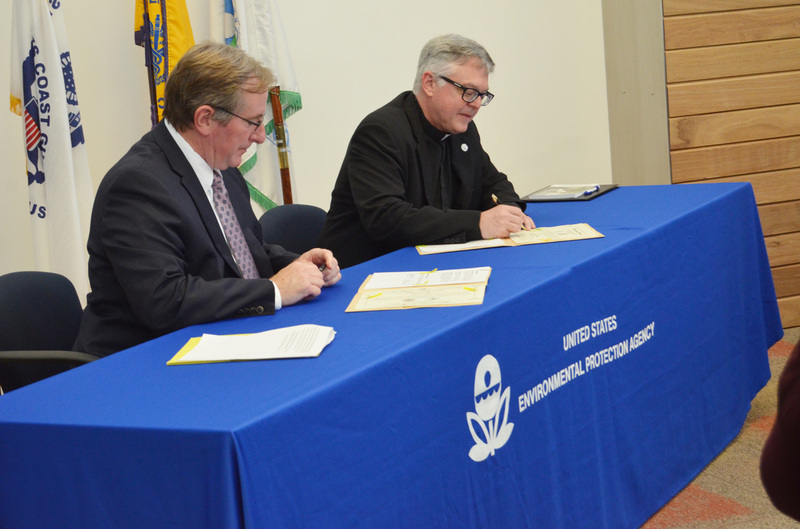 Additionally, Swetland signed a Memorandum of Agreement on behalf of the College with the Environmental Protection Agency (EPA) Region 7. Areas of cooperation between the EPA and the College include grant opportunities, joint research projects, faculty research participation, environmental student initiatives and more.